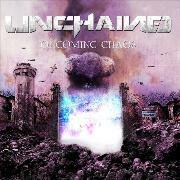 UNCHAINED has been in existence since 2010, and feature guitarist Jonathan Ranache as well as drummer Olivier Gavelle from KRAGENS. Together with Thibaud Vuille, guitars, Pierre Jourdan Gassin, vocals (ex KRAGENS) and GORGON bassist Joel Forneris they aim at delivering classic and melodic metal paired with growls. The chosen song style is both a blessing and a curse, as they lose some edge, but still they remain really heavy. Opener “Infernal Death Machine” is quite atmospheric, as well as melodic and forceful. The rest of the record is actually quite bland. They have all the groves they need, as well as two classy guitarists with riffs spraying from their ears. But the growling is almost ripping them apart. I´m not saying they should be totally without, but some fingertip sense should be used as to what style to use and when. But still, they smack my fingers with the gigantic gargantuan monster track “Freedom Through Fire”. The power and the glory of that riff and refrain is enough to leave me speechless. The catchy “Death from Above” also lingers well, but for the rest of the album my general idea can be applied.